They say it's your birthday.....Happy Birthday to YOU! Today the Kitchen Sink Stamps Design Team is doing a Virtual Birthday Card Blog Hop to wish Maria Colosimo, the owner of Kitchen Sink Stamps a Happy Birthday, won't you stop by and wish her a Happy Birthday! Here's hoping you have a wonderful birthday, enjoy your day! I used Kitchen Sink Stamps Multi Step Lilacs as my focal image, stamping in Eggplant, Amethyst and Bashful Blue. Click here to view my You Tube Video on how I stamped the Lilacs. The Brown background panel was created using the Glimmer Marbling Technique from the June TJNL. Beautiful card, luv the layout! Beautiful card is right! Love that background! Thanks for taking the time to share a video with us, which is great! 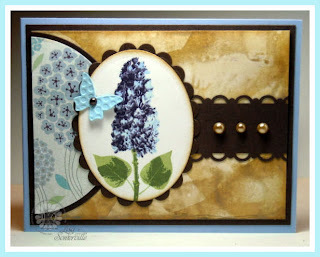 The lilacs are beautiful and I love the paper combination you chose for it. Lisa, this is beautiful. Your lilac is beautiful and is even more enhanced by the wonderful background. Love this great layout. The crew is just amazing. I'm enjoying the birthday hop!! What a sensational layout to showcase Maria's remarkable lilac! That marbled background is stunning! Beautiful punch work as well! What a wonderful birthday creation for Maria. Your work is gorgeous, Lisa! You really make those Kitchen Sink Stamps sing ... love those lilacs. This i just sooo beautiful, Lisa! What a wonderful layout...just perfect for this lilac!! I agree with everyone, such a beautiful card! Beautiful as always, Lisa! The colors of lilac are so rich and gorgeous! Fabulous card!! Such a great layout...the colors work fabulously with each other. Yet another stunning card Lisa. Wow! Lovely design and love your background, so soft and lovely. Beautiful flowers!